PFA Dehradun flood relief team treating one of the horses. On June 16, enormous floods cascaded through Uttarakhand in northern India, sweeping away thousands of people and devastating the beautiful countryside in the foothills of the Himalayas. Several of India’s most holy temples are found there, including Kedarnath, which was left still standing, but severely impacted with many feet of mud, and many deaths in and around the temple. Among the casualties in the area are thousands of mules, donkeys, and horses who carried pilgrims up the steep mountains to the sacred sites. Many animals died in the floods and others, sadly, have died since in the flood’s aftermath, as they sought food and safety higher up on the precarious mountain slopes. However, thousands of mules and other equines remain stranded, in urgent need of help, on the far side of the rivers, including the Alaknanda River. Horses on the route to Kedarnath carrying pilgrims, before the floods. All the bridges on this section of the river were destroyed in the floods. The animals need to be led to safety across temporary bridges, and there is an immediate need for helicopters to air-drop fodder to them. Some animal fodder has been provided, but only a fraction of what is needed. Several animal organizations are helping, including Humane Society International, PFA Uttarakhand, PAL Thane, PFA Dehradun, Animal Ashram, Help Animals India, and others. The following information is from PFA Dehradun, one of the groups assisted by Help Animals India. Starting with the most recent news – on July 3, 2013, Manavi Bhatt, of PFA Dehradun, wrote that the government has now begun building a temporary bridge for the evacuation of the animals. Earlier, on June 26, the army had built an iron foot bridge at Lambagarh. PFA Dehradun had been asking the District Minister of Chamoli to deploy the army to build a bridge across the River Alaknanda near Hemkund Trek, a 15,000 foot high sacred site, with a glacial lake surrounded by seven mountains, where many animals remain stranded. 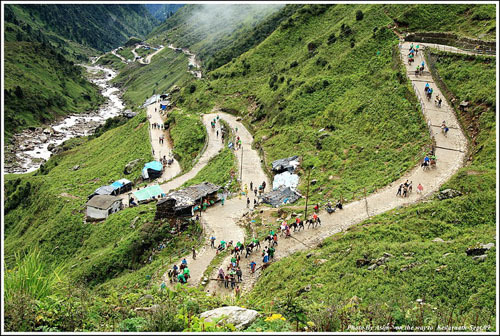 Nearby Ghangaria serves as a base camp for travelers going to Hemkund or to the Valley of Flowers. There are animals stranded there too without food. 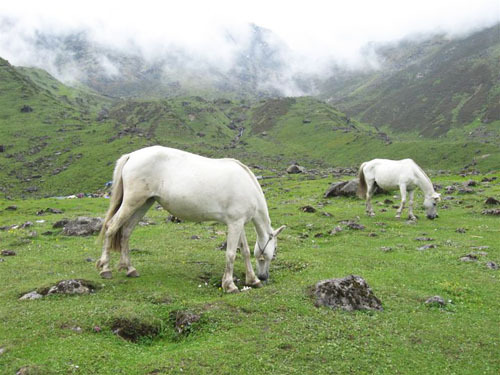 Horses in the Kedarnath hills, before the floods. Tons of animal fodder are lying at airports, but with bridges and roads washed out, logistics of getting it to the animals are difficult. Helicopters need to be requisitioned. The area is filled with many rivers of rushing water and very steep terrain. Most of the stranded pilgrims have been evacuated, though there remain the bodies of the dead to be collected, and there are villages higher up where people are still in need of help. Some of the local guides have stayed behind with their stranded animals. On June 29, Manavi Bhatt wrote that PFA Dehradun volunteers Pankaj Pokhriyal, Jasbir Singh, and others were reporting from the scene of the disaster that evacuating the animals is essential. There are very large numbers of mules and horses, and the minimal amount of food that is reaching them cannot continue to be supplied. No food has reached the animals stranded higher up on the slopes. She expressed her thanks to Animal Ashram of Lucknow for transporting fodder, at their own expense, all the way from Lucknow (in Uttar Pradesh, just south of Uttarakand) to feed the animals. On July 26, a joint Team of Raahat Veterinary Hospital (PFA Dehradoon) AAGAAS Federation and PAL Thane, supported by Help Animals India, set out to conduct extended relief operations for the working animals in the Chamoli District, Uttarakhand. There had been a prior plan already in place to help the animals who work so hard going up and down the trails carrying the pilgrims, and an on-the-ground assessment had been done prior to the floods. It’s not easy for someone who’s never been there to form a clear picture of where the sites are and of the situation. All disaster are difficult, and this one is no exception. Stressed and overwhelmed government authorities are trying to help the humans as a priority. Animal groups are struggling heroically to help thousands of animals, with meager resources, not enough government help, difficult communications, dangerous rushing rivers, and the nearly insurmountable challenge of trying to get helicopters to air-drop fodder, and temporary bridges built to evacuate the mules, horses, and donkeys. Help is still much needed, and animal groups continue to do exhausting work to get food and medical care to the animals. To give a donation, here is the website of Help Animals India . To read this and other news, here is the Facebook page of PFA Dehradun (caution – disturbing photos). Top photo: Courtesy of PFA Dehradun / Food relief team treating one of the horses. Second photo: anarupa_chowdhury / Wikimedia Commons / “This file is licensed under the Creative Commons Attribution 2.0 Generic License.”/ Horses on the route to Kedarnath, before the floods. Third photo: Samadolfo / Wikimedia Commons / This file is licensed under the Creative Commons Attribution-Share Alike 3.0 Unported license. / Horses on a hill near Kedarnath, before the floods, July 3, 2011.